The proportional representation election system, which allocates Knesset seats to a party based on vote percentage, rewards niche parties. Substantially. New to the ranks of high stakes politics is the Zehut Party, led by 56-year old Moshe Feiglin, projected to win up to seven of the 120 Knesset seats. A long-time fringe political activist, Feiglin’s surprise surge to powerbroker status is attributable to his championing of legal marijuana, which appeals to many voters who are most likely totally unfamiliar with the rest of his platform: annex the West Bank and encourage Arabs to leave the territory, among other nuggets. Eminently cognizant of his sudden celebrity status, Feiglin has named his price to support a right-wing coalition: Minister of Finance. This, of course, puts him on a direct collision course with the current Minister of Finance, Moshe Kachlon. He has staked his entire political career on socio-economic reform and intends to keep his perch. A former Likudnik, Kachlon bolted to found the Kulanu Party in 2014, notching an impressive ten seats in the 2015 election. No longer the new shiny toy, Kulanu will be lucky to get four or five seats this round, just squeaking over the 3.25 percent vote threshold, which translates into 4 Knesset seats. But the largest question of this election is the verdict Israelis will render on their prime minister. Benjamin Netanyahu’s last-minute ads depict him as the only leader capable of representing Israel globally. He quite deservedly brags about the tremendous strides in developing relations with Arab and African nations, and his efforts to promote Israeli innovation. Bibi’s brand is tough, experienced, brilliant. Tainting the value, however, are whiffs of corruption, imminent indictments, and plain old voter fatigue after more than ten years of Bibi at the helm. Several years ago, a constant refrain in political discussion in Israel was: “If not Bibi, then who?” As if in a country of 9-million people, there is no other talent capable of doing the job. Into this breach steps Benny Gantz, former Israeli Defense Forces chief of staff and leader of the Blue and White Party. 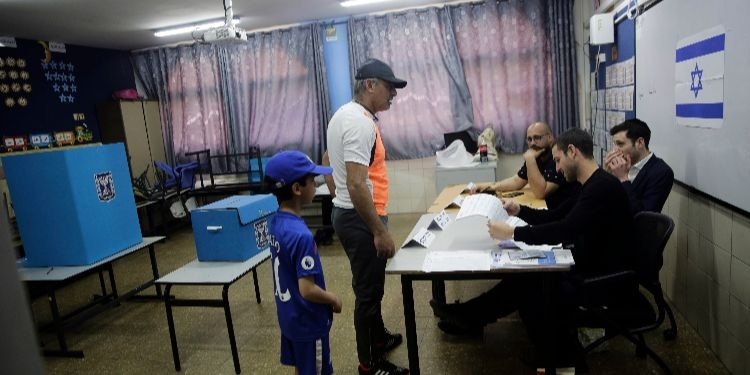 Israeli law prohibits publication of polls within three days of an election, but the last round tracked a squeaker between Likud and Blue and White, the conglomerate of the centrist Yesh Atid (“There is a Future”) Party, led by Yair Lapid, and Hosen Yisrael (“Israel Resilience”), the party founded by Gantz. The contest for the largest number of mandates is fierce since the opportunity to attempt to form a governing coalition tends to be granted to the frontrunner. Though, not necessarily. The President of the state of Israel, former Likud MK Reuven “Ruby” Rivlin, holds the baton and will designate first pick to form a government. The deep enmity between Ruby and Bibi is well-known and appears to have been exacerbated in recent days. Ruby has publicly berated Bibi for resorting to what he calls racist fear-mongering to motivate Likud voters to get to the polls. There are 120 seats in the Knesset. Even if Blue and White tally a few more than Likud, the likelihood of them succeeding in forming a governing coalition–of at least 60 MKs–is remote. Most of the smaller parties in the mix tend to lean right-of-center: New Right, Shas, United Torah, Zehut, and others. Left-leaning and centrist parties more compatible with Blue and White are predicted to command fewer Knesset mandates. To have any hope of forming a government, Blue and White would almost certainly have to include the two main Arab parties in a coalition, which is unlikely to be sustainable. The party leaders have, however, expressed a willingness to at least discuss the possibility, which may be enough for Ruby to give the first crack to Blue and White. As has transpired in virtually every election, it is the ultra-orthodox, with their bloc of approximately 12 seats, that will swing the ultimate result. They will never work with Blue and White, in part because of Yair Lapid’s involvement. Due to his consistent and unwavering efforts to seek legislation that would compel ultra-orthodox citizens to serve in the IDF, he is the Devil incarnate to this powerful constituency. And, therein, is the real rub. Allowing ultra-orthodox parties the ability to, in effect, subvert the democratic will of the majority of Israelis is the real threat in this country; one that few politicians have the courage to expose and challenge. The only certainty in this election is that the results will be surprising and the subsequent coalition negotiations will provide up to two months of nail-biting for political junkies. Final pre-election polls in 2015 had Likud at 22 mandates and Zionist Union (merger of Labour and Tnuah) at 25. On election day, Likud won 30 seats, the equivalent of a “landslide” in Israeli politics, and with Zionist Union at 24. It was a total reversal of the projections. Today, Labour is staying alive with ten projected seats, while Likud and Blue and White are each polling around 30, give or take a few seats, depending on the poll. As a very astute political professional remarked to me on Sunday: “I wouldn’t be surprised if Likud prevails. Then again, I won’t be surprised if Blue and White win.” And, as ever, victory will belong to the spoilers.